I signed up. 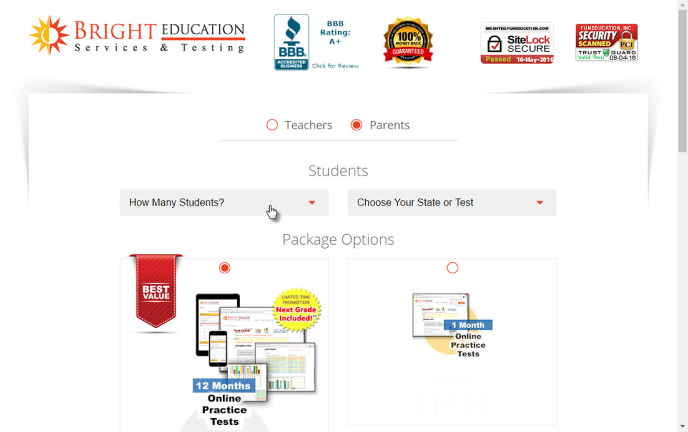 How do I access the Online Practice Tests? How many questions do each package have? What are the benefits of ordering the 12 month package? Does the answer appear right away? Can I change the grade level part way through the year? What grade level should I select at the beginning of the year? How much time should I allow for each test? I renewed my subscription. Where can I find the new tests? We offer two packages for parents, a one month option and a 12 month more comprehensive package. With the 12-month package, you get a full year to practice and review the materials. Some customers who order this package use it intensively for a month, others spread out the studying over 3 months or longer. With the 12-month package, you don't have to worry about it expiring for whole year no matter how long you use it. Also, there are other benefits of buying the 12-month package besides the time extension. You get access to Science & Social Science questions which you don't with any of our other packages. You also receive more practice questions than our other packages... up to 1,500 total per grade level. Our other packages only offer 500-700 questions total per grade level. Accounts start from just $19.97!